Welcome to On Ya Case Personal Training & Massage Therapies. 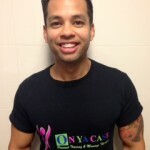 Here at On Ya Case, we take pride in being passionate,dedicated and enthusiastic health and fitness professionals. We are here to guide you to optimum health and well being and understand that all of us have different needs, so we will personally design a health and fitness program to suit you and the goals you want to achieve. Our Fitness Professionals will empower you to achieve all your health, fitness and well being goals and to make them a long term lifestyle choice. So lets take this journey together in creating a healthier & happier you. I NEED TO LOSE WEIGHT FOR A SPECIAL OCCASION ? IS THERE A WAY I CAN RECOVER FASTER SO I CAN TRAIN HARDER ? I WANT TO BUILD LEAN MUSCLE ? HOW CAN I GET THE MOST OUT OF MY WORKOUT AND GET RESULTS ? HOW CAN I DE STRESS FROM MY BUSY WEEK ? These are just some of the many questions I get asked and here at On Ya Case Personal Training & Massage Therapies we offer a variety of great services that can help answer those questions and help you achieve all your health, fitness & well being goals. Some of our great services include Personal Training, Boxing, Remedial Massage and more. Contact me now for your FREE 1 HOUR PERSONAL TRAINING & HEALTH ASSESSMENT.